Desert Roots Kitchen, Tempe, AZ – Organic and Green in the Heart of the Desert! During a road trip between the Grand Canyon and Joshua Tree National Park , my husband Steve and I spent one night and morning in Phoenix. In search of a place to enjoy lunch after a morning visit to the Desert Botanical Garden, we found Desert Roots Kitchen (DRK) through an online search for organic foods. We discovered on arrival that Desert Roots Kitchen is 100% vegan. Their menu changes daily and they make everything from scratch in-house (except the dolmas). 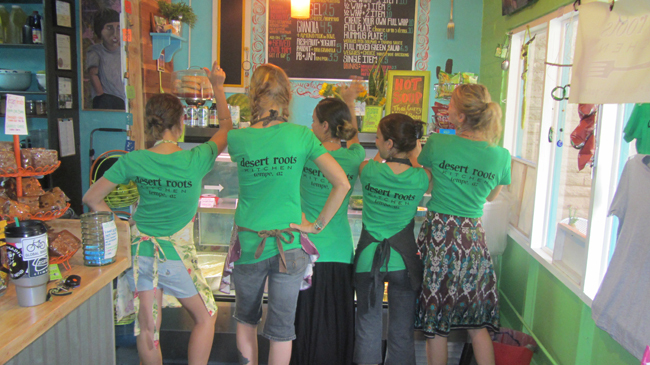 Desert Roots Kitchen cooks with many organic ingredients, especially staples like beans, lentils, produce, etc. They support and use local ingredients when possible, which is increasing and constantly evolving.